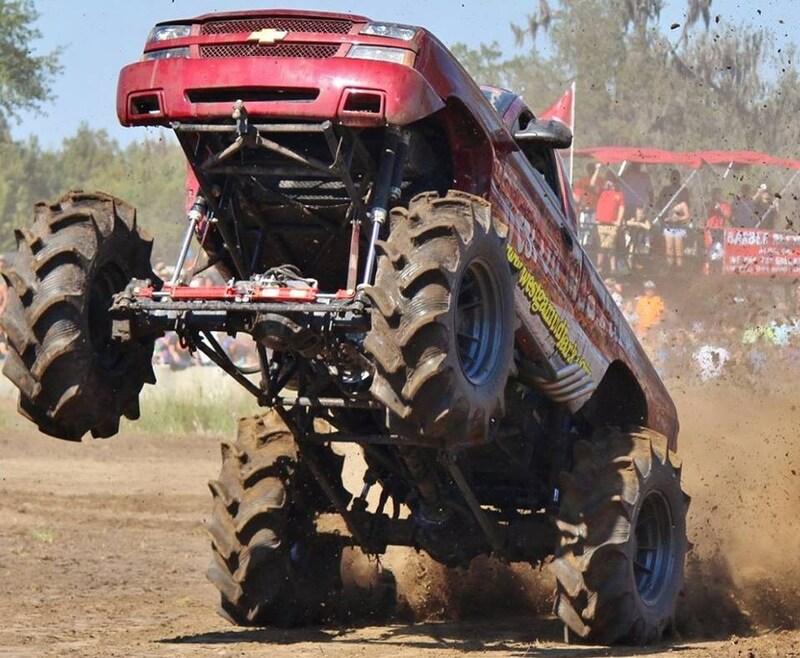 This Blown Big Block powered Chevy Mega Mud Truck owned by Joey Adams of Tallapoosa, Georgia is a Wheelie Pulling Machine. The 2005 Chevy Truck was cool back in its day but after its recent overhaul at trucks by trotter in Sandford, Florida it is an entirely different animal. The old tired Big Block was swapped for a Nasty 540 cubic inch Fire Breathing Big Block Chevy Engine with psi 871 hihelix blower sitting on top pushing out a whopping 1850 Horsepower. All that power is handled by a fully built power glide transmission and a straight drive transfer case. Trotter and the team ripped out the old 2.5 ton axles in favor of some Beefy Meritors. These can handle the added power and stress of riding on the back 18.4×26 tires. The Chassis and Cage Design protect the driver in case of a rollover and also provide mounting points for the nitrogen shocks and new fourlink suspension setup. The Truck has so much power now that it will wheelie from a dead stop lifting both front tires high off the ground. Joey’s passion for the mud doesn’t stop with his truck he is also the owner of the World Famous West Georgia Mud Park where some of the Baddest Mega Mud Trucks in the Nation come to Race and Play in the Mud. He also has a race truck called Geronimo and his Son Kyle has a Race truck called Gunsmoke. Watch Joey Show Off in this one of a kind Mega Chevy in the Videos Below.